I’m going to be honest, I was a little apprehensive when I saw the Hillary’s craft competition. I sit and stare longingly at my sewing machine fairly often – when I set up my lovely craft area I made sure it had a permanent space on the desk – but I’m not very confident with it. The Safi Turquoise fabric was pretty enough to tempt me to take part though – look at it! Yum! When I took the fabric out of the package I let out an audible gasp – it is luxuriously thick, with a really gorgeous sheen to it. Something else I wasn’t expecting is that it’s almost reversible – the back of this fabric is the negative of the above – so it’s blue foliage on a fantastic silvery background. The fabric was so lovely I spent a while being daunted by working with it, which meant I’ve been through several false starts with this project. First off, I wanted to make some bunting for the garden. We’ve been doing a lot of garden painting lately and everything is in lovely shades of blue, so this would fit in perfectly. My vision was for some crochet triangles, and some fabric triangles, using both the back and the front of this lovely fabric. This was what I was looking at for my crochet parts of the bunting. I even went as far as ordering the biggest reel of bias binding in the world for this idea. When I cut out my triangles though, the fraying of the edges meant I couldn’t easily make the bunting without sewing two pieces together, and the thickness of the fabric meant that it looked, well, weird when I did that. I could have used bias binding around each edge instead of sewing two pieces together I suppose, but it just felt… fussy! I wanted the fabric to be the star, it didn’t need a frame. So back to the drawing board I went… and instead of a drawing board I came up with a pin board! I have a frameless pin board which I’ve been thinking of covering with fabric for ages. But when I thought about it, sticking pins in this lovely fabric felt like a bit of a waste, and I wouldn’t have got much use out of the sewing machine by cutting and stapling! I also wanted to include some crochet in the project, to make it a bit more “Elsie Pop” and I couldn’t see how to do this with a frameless pin board. The third and final option I came up with was a cushion cover – I love making crochet cushions, and once upon a time I used the sewing machine to make some cushion covers… and messed it up – I got too excited with my seam allowance and they ended up far too big for the cushion pads, and a general disaster. I wanted to prove to myself that I could make a fabric cushion cover I actually liked. 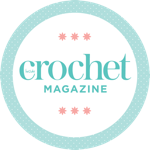 The plan was to make a cushion cover using the fabric and then to add to it with some crochet – either an applique embellishment or a frilly edging. I really don’t know what I’m doing with making a cushion, but I knew I wanted this to be a cover with a zip and I wanted to use a nice plump cushion pad. I usually stuff my crochet cushions directly as I use machine washable yarn and stuffing, but with a cushion pad involved, this had to be a removable cover to ensure it could be washed. So I hit the supermarket and bought myself a cheap but full cushion (£3.50 – it was so horrible I haven’t even photographed it). I pinched the cushion pad, and then I used the cover as a template to cut my fabric before also pinching the zip. Let’s call it recycling. After not too much swearing and frustration with the sewing machine, I had my cushion all ready to embellish! Only… hang on… it looked great already? After having a quick squish of the cushion, and showing the husband, we were in agreement – crochet wouldn’t add to this fabric. So to my complete surprise, my crochet and fabric bunting has turned into a sewing project! Sewing! Me! It is scrummy though – and I can still use it in my freshly painted garden! This is my new favourite part of the garden – I have crochet only bunting, fairy lights, a pretty painted fence, and my new cushion!! I love it so much – but now I think I need to recover my swing cushion! Of course though, something this gorgeous shouldn’t be left in the garden for most of the year in the UK. So I’m chuffed with how lovely this looks in our armchair too. I love this light turquoise cushion with my oxblood chair – such a pretty contrast. I am so impressed by this fabric. My sewing skills are minimal at best, and the wonderful thickness and sheen of this fabric has made this cushion look like an expensive shop-bought piece that I am SUPER proud to call homemade. It was a nice (and unexpected) change for me to not crochet as part of a project (that bunting triangle doesn’t count! ), but the fab results I’ve achieved with my sewing machine this time around have spurred me on to spend more time sewing – I’m delighted I took part. It’s nice to have a little area in the garden and I love how the colours of your bunting complement the cushion. You are right, that fabric is so beautiful, your cushion will look good everywhere. Me and sewing don’t love each other either. But your cushion has come out looking lovely! And that fabric is divine. It would also look nice as a seat cover for your swing chair! Which looks suspiciously like the swing chair in my garden here in Melbourne! That fabric is beautiful, love it and the pillow looks fantastic well done. I can see why you fell in love with the fabric Elsie, it’s totally gorgeous. I often find when I’m planning to do one thing with some fabric (or cards usually for me) the finished project is nowhere near what I had origionally intended but looks stunning anyway. I think your cushion looks lovely and nice to cuddle up to. Lovely cushion and I really like tour little garden swing area. I have a similar set up at bottom of my garden – just need some warm evenings to enjoy it! My fabric from Hillarys was lovely too – silky and thick – even the reverse side was gorgeous! Good luck in the competition!